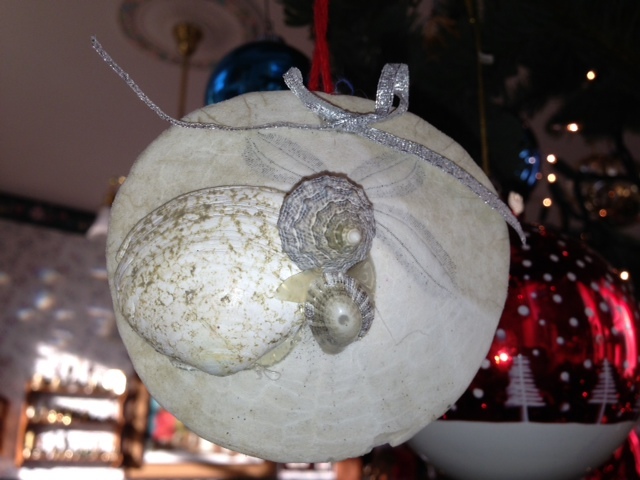 This ornament is made of shells found at Ocean Shores, a place where we spend as much time as possible! 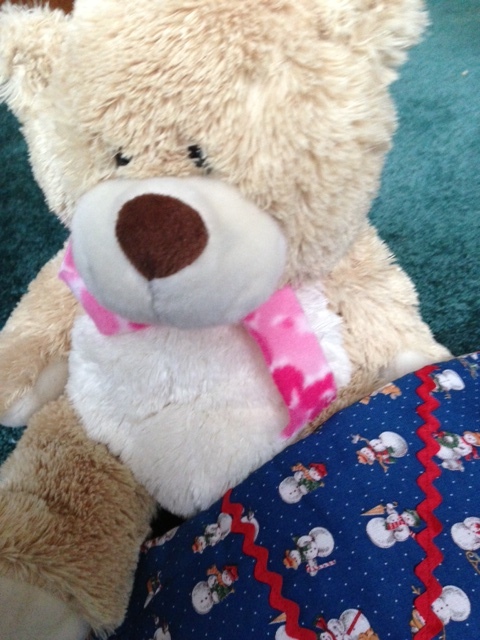 Ted and I are hopeless collectors, I think anyone would agree. 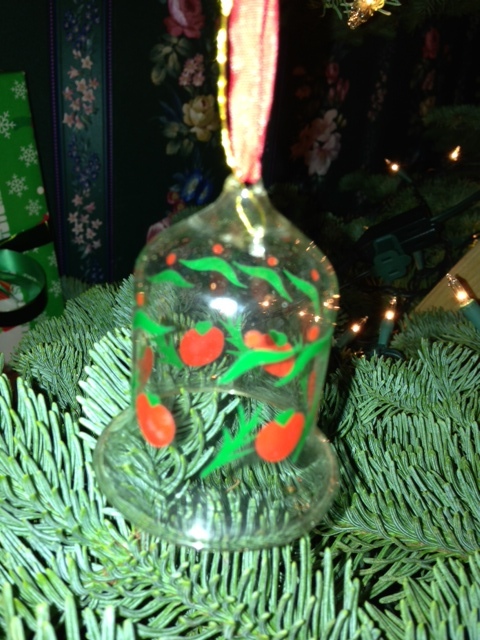 Over the years we have collected many Christmas ornaments and decorations and one of my favorite annual events is getting them out and remembering when, why, and where we acquired it. I thought I’d share a few with you. This one is actually a Christmas card we received last year, I liked it so much it sat out all year for us to admire. 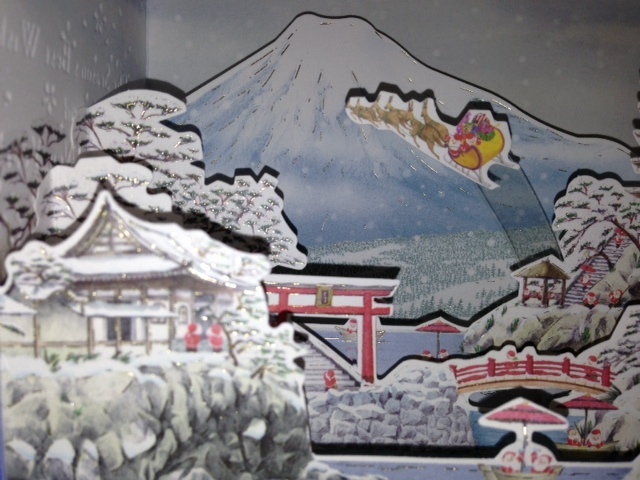 It was sent to us by our Japanese friends, the Saito family. Ted and I met Shuji on New Year’s Day in Tokyo in 1973, when he introduced himself to us to practice his English. We have kept in touch and visited back and forth many times over the years. That trip was our introduction to foreign travel. 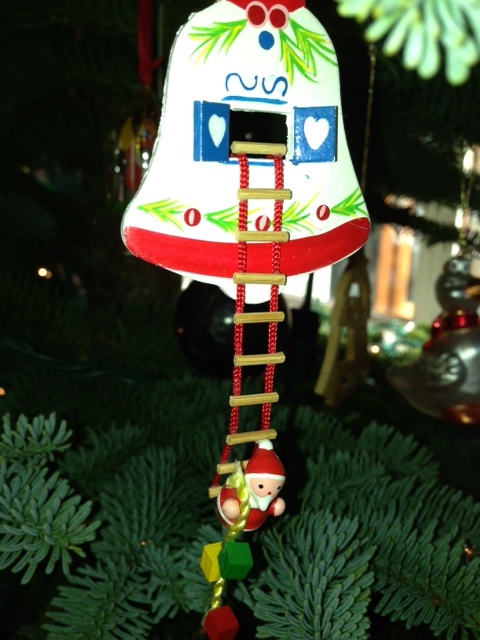 This ornament was purchased in Germany in the “storybook” town of Rotenburg. 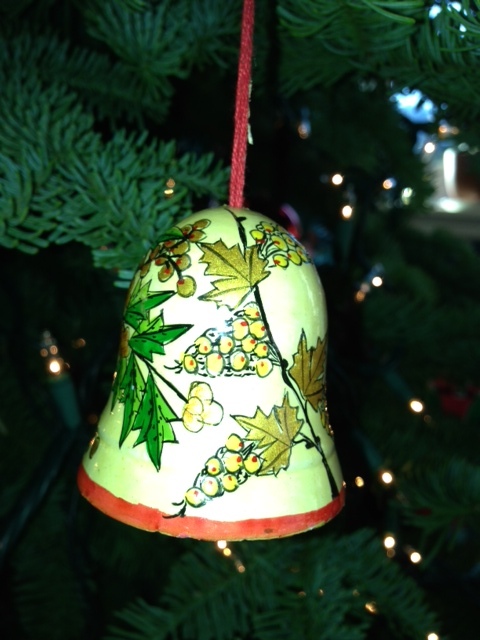 Many of the German ornaments were very detailed. My sister Janie’s family lived in the Philippines for many years working as missionaries. 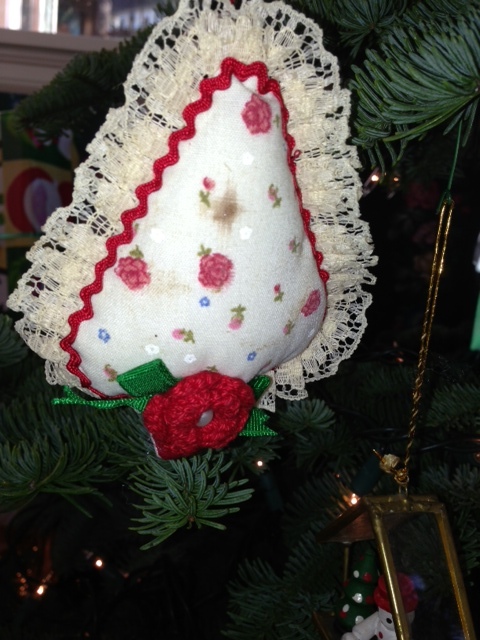 We purchased this cloth ornament on one of our trips to visit. 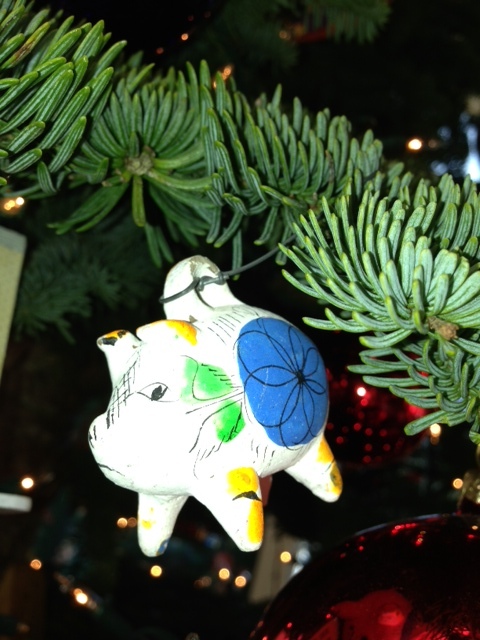 This clay pig was purchased in Mexico. In Korea I liked to browse the shops that carried reject ceramics made for export. 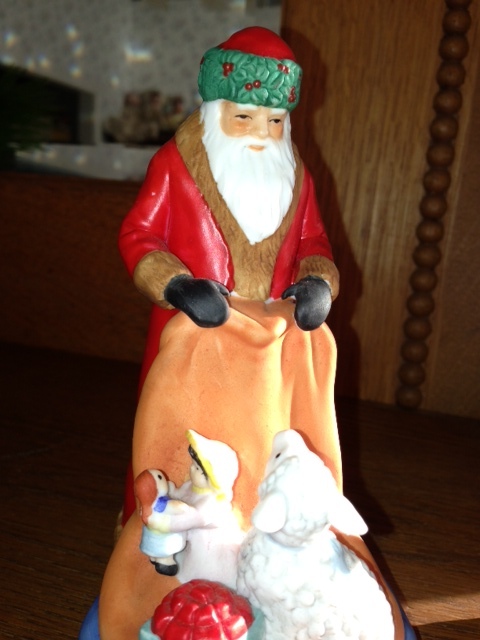 I especially like this little Santa figure. We got this clay bird in Guatemala. 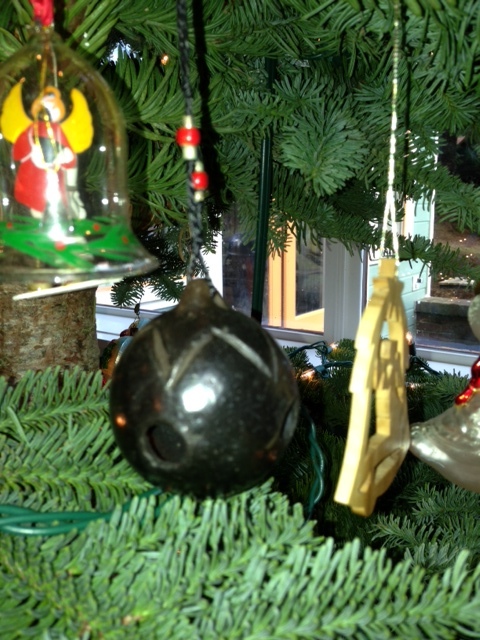 I purchased this ornament in India, it is made of paper mache. This Ethiopian ornament is rather unusual given its black color, it is made of clay. 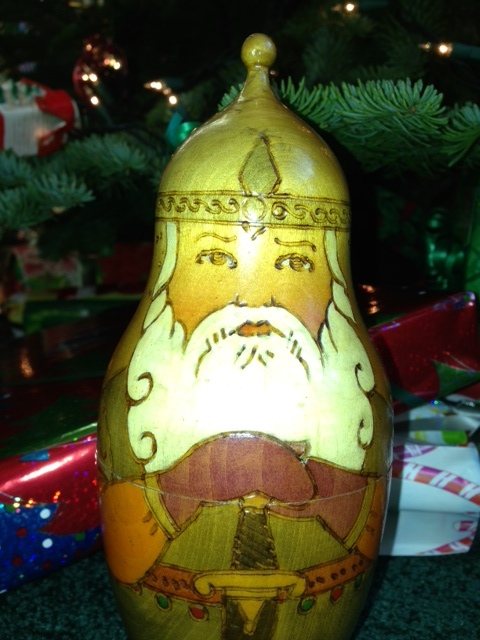 We traveled to Bulgaria many times while arranging adoptions and this wooden Santa was purchased there, but likely made in Russia and brought to Sofia by a peddler to be sold. 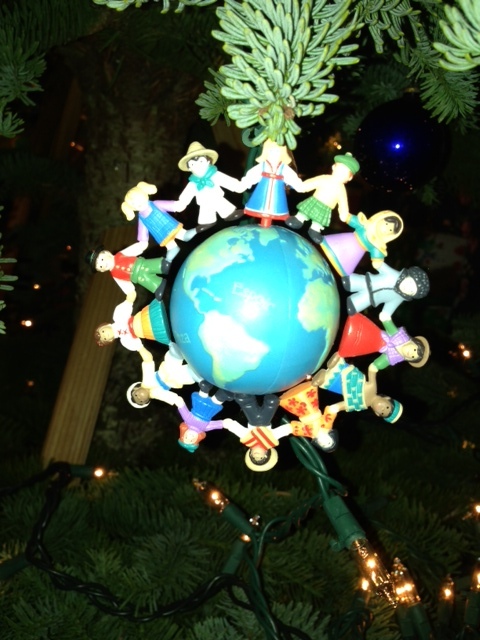 This ornament was given to us by an adoptive family to represent the children from many nations who have found adoptive families through our work. 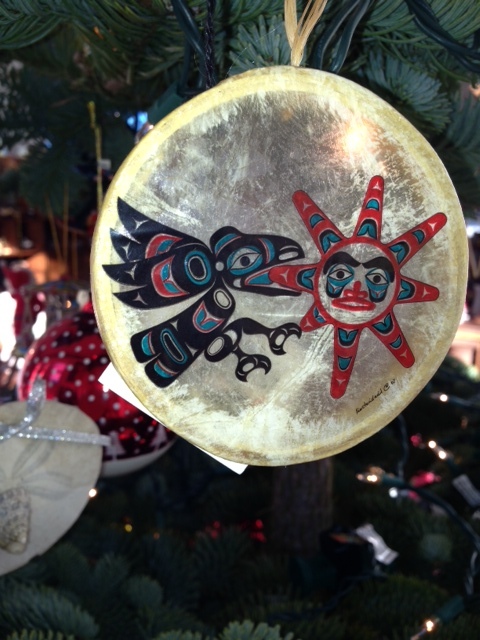 This ornament was purchased in Alaska and in Native style shows the Raven and the Sun, in honor of our son Raven. 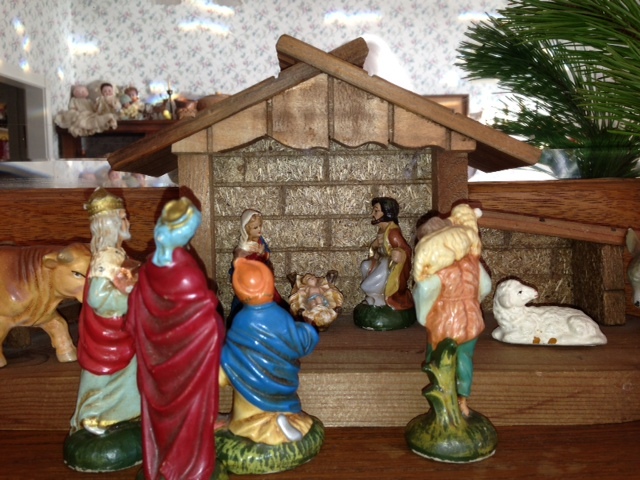 My parents gave us this Nativity set for our first Christmas together, 53 years ago. 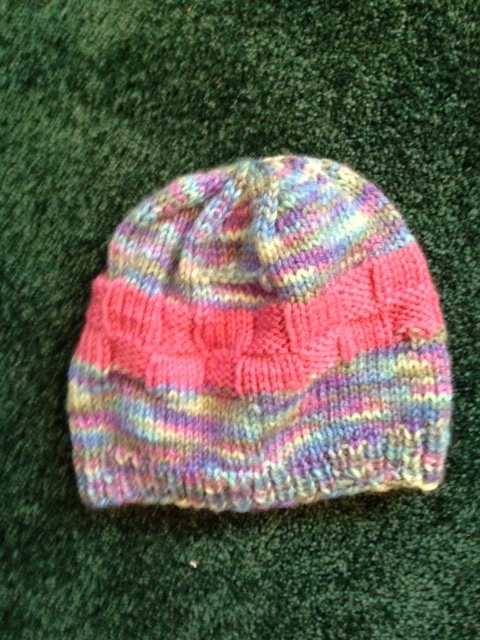 It has been loved and arranged each year and I am go grateful to have it. 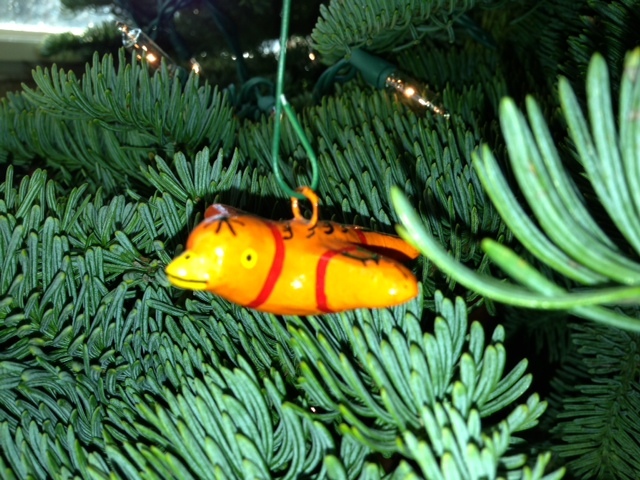 Of course this is the true symbol of Christmas we make it a centerpiece of our Christmas celebration. 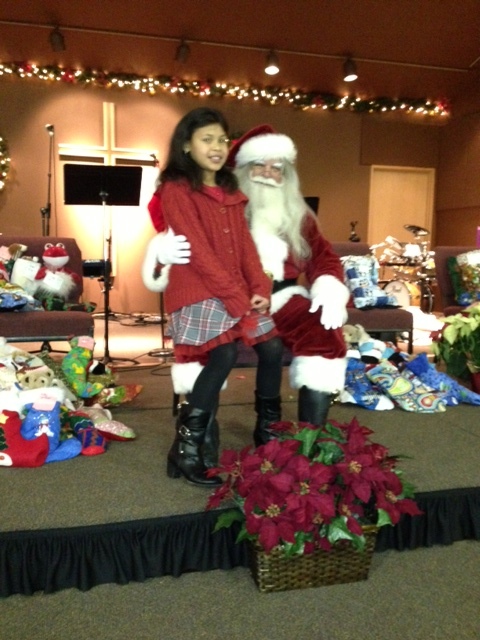 For the past few years our family has attended the annual Christmas Party dinner given for foster families in our area. 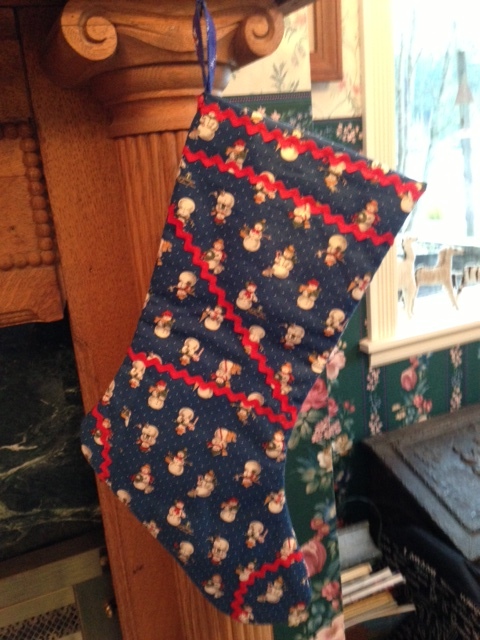 A highlight is, of course, the visit from Santa who gives each child a beautiful Christmas stocking filled with very nice little gifts. This year I have become a member of the Sunbonnet Sue Quilt Club and I learned that the members of this group make these stockings. 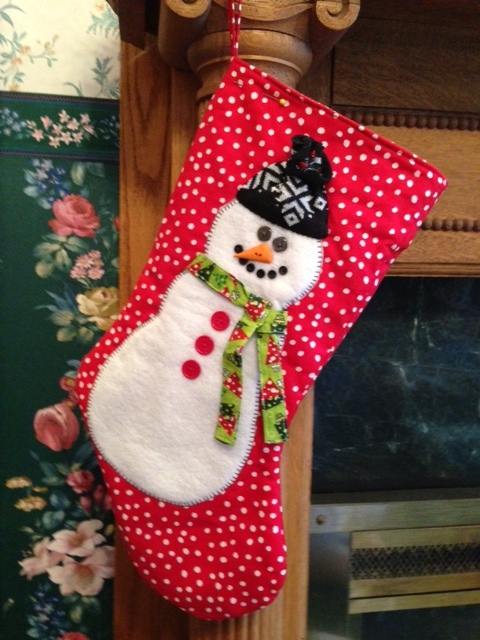 I liked the stocking pattern and made four or five which, which, when joined with those made by others, totaled over 200 stockings. 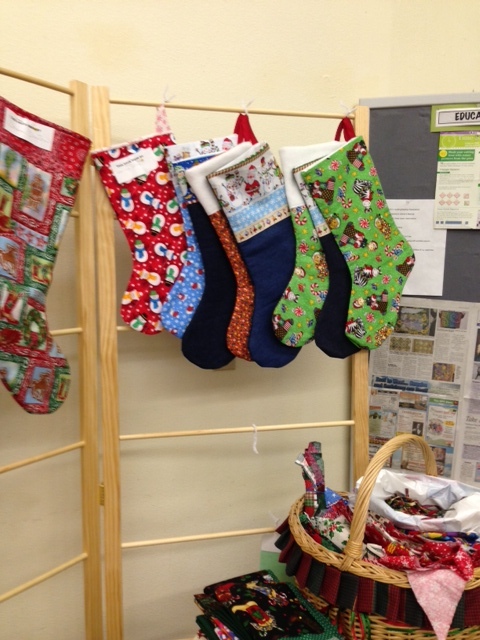 I learned that these stockings will actually be given next year and between now and then, another group will add toys, another will make a pillow case for each child and another will knit a hat to go into each stocking. 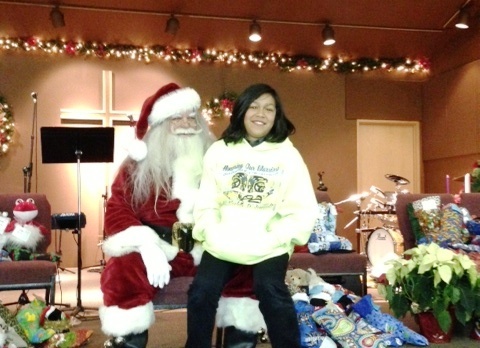 Friday night was the party and even Raven, 12, lined up with the young teenage boys and took his turn to sit on Santa’s knee. 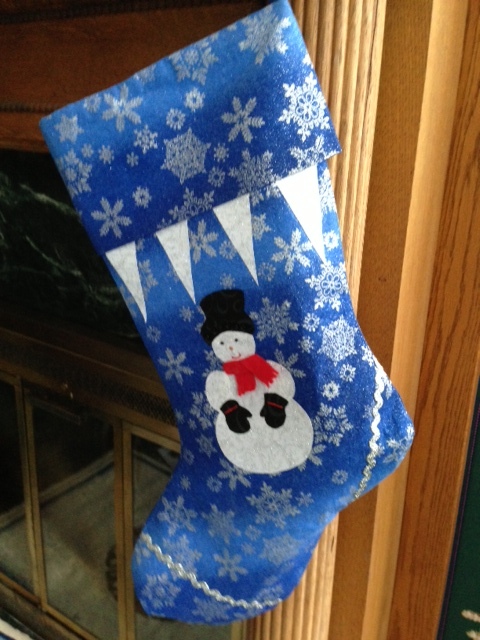 And stockings for these boys were especially full. This was an introduction to Santa for our two-year old foster daughter and her little brother. 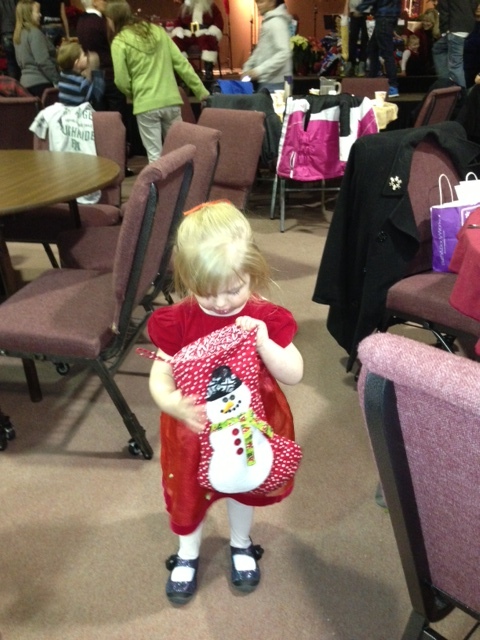 Neither was shy, and the little girl was very excited to see what was waiting for her in the stocking. I am glad I know more about how the stockings come to be made and filled and feel especially lucky to be on both the giving and receiving end of things.